This tour departs at various times throughout the day. Open from: 9 am to midnight (mid-June to early-September, Easter Weekend ans Spring Holidays). Open from: 9 am to 11 pm the rest of the year. First departures: 10:30am. Last departures: 5pm in winter, 9:30pm in summer. This tour operates all year. Choose the earliest time to avoid crowds or the latest time to cruise the city by twilight. We are comparing Eiffel Tower 2nd Floor and Seine River Cruise Prices from leading ticket suppliers and Try to find you Cheap tickets prices on the market. This combo ticket combines a visit to the iconic Eiffel Tower and the river cruise along UNESCO-declared riverbanks of the River Seine. In the Eiffel Tower, you will admire fantastic panoramic views of the city beneath you. The guided tour will reveal various interesting facts about the outstanding attractions of the City of Light. From the 2nd level you’ll have an entire city in your palm. Examine the Triumphal Arch, Notre Dame Cathedral and other marvellous landmarks of Paris. 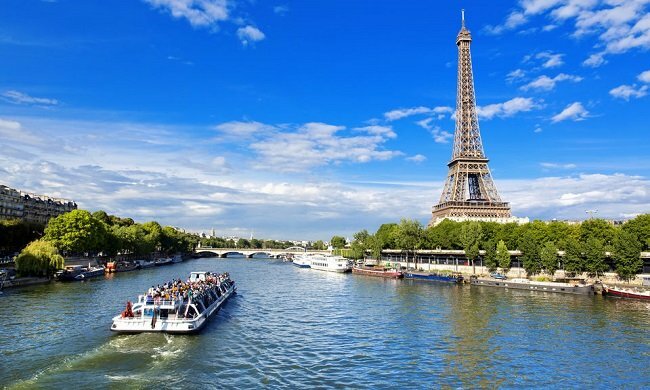 During the cruise, see the top attractions adjacent to the River Seine. Pass by the Louvre Museum, Orsay Museum, Ile de la Cite with the Notre Dame and Concierge, and other points of interest. This package is suitable for everyone interested in enjoying two premium activities of Paris. It is convenient and time saving as you’ll be able to book both tours at one time. Your Experience With Eiffel Tower 2nd Floor and Seine River Cruise? With this combo ticket, you will experience two essential activities of Paris - visit the iconic Eiffel Tower and enjoy the sightseeing tour along the River Seine. With your priority entrance ticket, you head straight to the 2nd floor of the Tour Eiffel, from where you can appreciate views of the city from above. Along the way, the tour guide will inform you about various interesting facts and details of one of the most famous landmarks in the world. Take a look at other famous attractions of Paris, including the Louvre Museum, Notre Dame Cathedral, Triumphal Arch, Alexandre III Bridge and others. During the cruise, admire many top attractions of Paris up close. Among other points of interest, you will sail by the Orsay Museum, Louvre, Notre Dame and under Pont Neuf, Alexandre III and other bridges. What Eiffel Tower 2nd Floor and Seine River Cruise Includes? Priority entry ticket to the Eiffel Tower. Informative guided tour with a qualified guide. A 90 minute guided tour of the Eiffel Tower. A 1-hour cruise on the River Seine. Direct access to the 2nd level of the Iron Lady. Use the Eiffel Tower’s telescopes to take a closer look at the city’s landmarks. If possible, take the Seine River cruise at twilight. Travelers Reviews about Eiffel Tower 2nd Floor and Seine River Cruise? Opinions about this combo ticket by former participants are almost all positive on the websites TripAdvisor and Get Your Guide where travellers have given the tour 4.5 and 4-stars out of 5. Tourists have a good opinion about the guided tour of the Eiffel Tower and the overall combo tour experience. Their comments also confirm that cruising the Seine River is one of the top things to do in Paris city centre. The tour of the Eiffel Tower isn't suitable for people with walking difficulties. You can bring either mobile or printed voucher to confirm your participation in the guided tour. You are eligible for a full or partial refund if your cancellation is made within the specified time period. Choose the preferred option for your visit to the Eiffel Tower - either a visit to the 2nd floor or the 3rd (top) floor. After joining the guided tour of the Tour Eiffel, you will receive your tickets for the Seine River cruise. In certain circumstances, the operator can change the start time of the guided tour. Meeting Point: 33 Avenue de la Bourbonnais (Get Your Guide), or Trocadero for tours purchased with Viator.